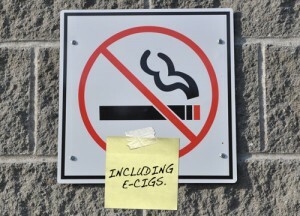 Per Act 19, Session Laws of Hawaii 2015, “electronic smoking devices” are now prohibited anywhere that smoking cigarettes or other tobacco products are also prohibited, including all enclosed or partially enclosed places of employment, as well as within 20 feet from entrances, exits, windows that open, and ventilation intakes that serve an enclosed or partially enclosed area where smoking is prohibited. This new law took effect on January 1, 2016. Any cartridge or other component of the device or related product, whether or not sold separately. Employers who have no smoking policies for their workplace should update those policies to also include electronic cigarettes as well. On July 8, 2014, we passed the final deadline of the 2014 Legislative Session, the Veto Deadline. The Veto Deadline is the date by which the Governor must either sign or veto a bill. Any bill that is not vetoed becomes law “without the governor’s signature.” This year, the Governor did not veto any of the employment-related bills. A full list of bills that may be of interest to employers can be viewed on the HEC Legislative Digest, which can be accessed on the Legislative Updates section of the HEC website. The Legislative Digest is currently available to the public. In addition, HEC members can also access a Highlights article that discusses several of these new laws in more detail. In addition, I was also recently interviewed by the Pacific Business News (“PBN”) on some of the bills we anticipate will be heard during the 2014 legislative session, and their write-up ended up being the cover story for today’s edition of the PBN. In addition to discussing employment law bills, the PBN article also discussed bills related to other issues affecting Hawaii employers. PBN subscribers can access the article here: Major Business Issues Facing the State Legislature in 2014. On a final note: To anybody who goes to the Capitol during session, if you see me there (and I will be there often), please feel free to say “Hi.” Oh, and Happy New Year everybody!